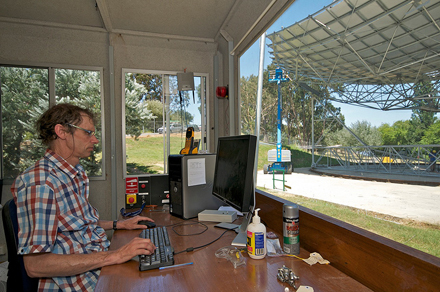 Led by Associate Professor Dr. Keith Lovegrove, the Australian National University's (ANU) Solar Thermal Group has constructed the world's largest solar collecting dish on the ANU campus in Canberra. This reflecting parabolic dish is 25 m wide and has 500 m2 of highly efficient purpose-built mirrors that reflect the sun's rays onto a collector coil. This converts water to steam, which drives a steam turbine that generates electricity. 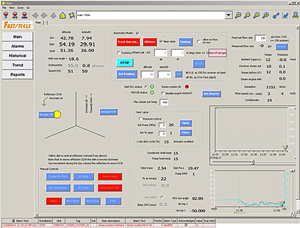 Yokogawa's FAST/TOOLS software fine-tunes the dish's ability to automatically track the sun and maximize the energy collected. This project had its genesis in the early 1970s, when a team lead by Stephen Kaneff and Peter Carden paved the way for the construction of the White Cliffs solar power station, with 14 comparatively small 20 m2 dishes. 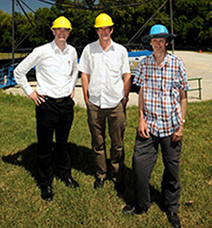 Convinced the idea had merit, the team at ANU proceeded to scale-up the solar generator, with the first "Big Dish" built in 1994 using commercially available space-frame technology. According to lead researcher Greg Burgess, the aim of the solar project has been to demonstrate that solar generated electricity is viable on a commercial scale. Their thinking is that building fewer large dishes, which can be easily replicated in the field, is more economic than building lots of smaller ones. Planning is underway for the construction of a pilot solar generating plant that will prove out the concept already demonstrated by the existing solar generator dish. Mr. Burgess also sees other potential applications for super-heated steam produced by reflected solar energy. Such is the intensity of energy generated by the dish's efficient design that when concentrated it can melt through solid aluminum, stainless steel plate, and even the hardest ceramic known to man. Yokogawa Australia is involved in this exciting solar energy project, which may provide the key to future solar energy projects in Australia. The latest dish, SG4, was completed in June 2009, and since then a great deal of effort and research by Mr. Burgess and others has gone into fine-tuning the solar tracking, sourcing computer, and communication components, testing optical performance, and installing and testing the first steam generating receiver. Yokogawa has worked closely with these researchers to optimize the performance of this system by providing a PLC SCADA system that computes the precise position of the sun to ensure millimeter perfect tracking of the sun. The system also includes safety features that, for example, will put the dish into a "parked" position at night and before storms to prevent damage from high winds. As new units are constructed at this ANU facility, the plan is to employ Yokogawa's new HXS10 controller as a cost effective means to automatically track the sun and ensure maximum efficiency of the solar reflecting dish. Dr. Lovegrove explained; "As a clean energy source, solar energy is a natural complement to wind and based on our climate is more available and provides most of the energy when you need it." "As an example, in a large system with an array of dishes all feeding steam to a single efficient large steam turbine, each dish of this size would contribute the production of more than 100 kW when operating at full efficiency in full sunlight. Roughly speaking, up to 100 advanced energy-efficient homes could be powered by every dish. A solar field the size of the ACT could power the entire country." "The medium term goal for the concentrating solar technologies is to make electricity for about the same cost as wind, which is currently around 10-12 cents a kilowatt/hour. While that's around double the cost of conventional coal-fired power stations, it may prove to be cheaper than adding carbon capture and storage to existing coal-fired power stations." "Of course, the ultimate energy economics will be influenced by ruling government policy, with any moves to tax carbon impacting on fossil fuel power stations and tipping the economics more in favor of alternate energy sources in the future." "We are very happy with the high reliability of Yokogawa's system. This is very important to keeping our solar plant running 24/7/365. Also, our engineers can easily configure the system at any time. FAST/TOOLS benefits us in many ways and allows us to clearly see the entire process, giving us the information we need to take immediate action."